‘Tis the season to fill your stockings with stories of holiday hazards. Most of us know to keep the chocolates and tinsel away from our pets; these safety tips serve as a friendly reminder and will also help you recognize some of the other things that might land your furry friend in the emergency room over the holidays. I can tell you from my own experience that a tempting panettone, well wrapped and in a festive cardboard container is no match for a determined little dog (and off to the clinic we went to make her vomit…). Although they love to eat it, rich “people” food spells trouble for dogs for a couple of reasons. One of the reasons is that some dogs don’t tolerate sudden changes in their diets; in addition, pancreatitis in dogs can be triggered by food high in the fat, butter and cream that makes it delicious to us and to our dogs. The pancreas is a soft organ that makes and stores caustic digestive enzymes in their inactive forms to be activated in the intestine. However, the pancreas actually has a very limited arsenal to protect itself from these very enzymes. In dogs, a chain reaction of pancreatic enzyme activation can be caused by a single high fat meal. Schnauzers can be particularly prone to this issue. Pancreatitis can range from mild to life threatening and the treatment is largely supportive. What does that mean? We can treat the pain associated with pancreatitis, address the fluid and electrolyte derangements from the vomiting, and give antibiotics when indicated, but nothing can be done for the pancreatitis process itself. Hence, we “support” the body while it attempts to heal itself. I say attempt because unfortunately, severe pancreatitis can be deadly despite best efforts. While you may not know if your pet has a particular sensitivity to fat, the holidays, when everyone is busy and distracted, isn’t a good time to find out. Grapes/raisins are toxic. Not all grapes & raisins, and not to all dogs (or cats). We have yet to figure out what it is in grapes that is actually toxic. But… some grapes and raisins cause potentially fatal kidney failure. Treatment ranges from IV fluids to dialysis depending on the severity of the kidney failure. Chocolate can be toxic, depending on the amount consumed (for the size of the dog) and the type of chocolate. The darker the chocolate, the higher the theobromine concentration. Theobromine is toxic in dogs. It can cause excitation (similar to caffeine) and fast/abnormal heart rhythms which can lead to seizures and cardiac arrest. Chocolate is even more toxic to cats but they rarely eat it, not because they are smarter (although most cats think so) but because they have little ability to taste sweetness and therefore don’t have as much of a sweet tooth. White chocolate is not really chocolate (it has no theobromine) but can still cause trouble for dogs because of the high fat content (see pancreatitis above). Bones can get stuck in throat or splinter and poke through the intestinal tract. Even though cats are not as prone to dietary indiscretions as dogs, they have no justification to be smug about their superior intelligence. 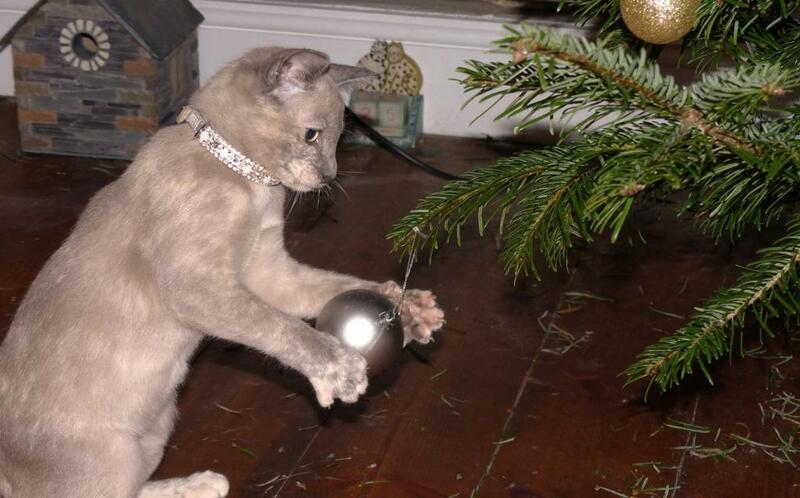 As we know, cats like shiny things, and Christmas trees and decorations invite mischief. Tinsel is not as popular as it used to be (thank goodness) as it was easily swallowed and caused what is known as “linear foreign body”. The string (or tinsel) can get caught up in the stomach or other area where it anchors and then causes the rest of the intestines to bunch up like an accordion. While poinsettias have gotten a bad rap as being poisonous, they actually are not toxic, but they can cause stomach upsets. Lillies, however, are very toxic to cats; just brushing up against the flower and then licking their fur can be enough to cause kidney injury in our feline friends. Now that you know what to avoid, we know that you won’t be feeding bones, chocolates or fatty treats. But in the hustle and bustle of the holidays, distracted humans may not successfully anticipate all the ways their pets can get into trouble. Dogs can be very adept at unwrapping and consuming the gift chocolates under the tree, or finding the shortbread that your friend left in her purse on the floor, right at little dog nose level. 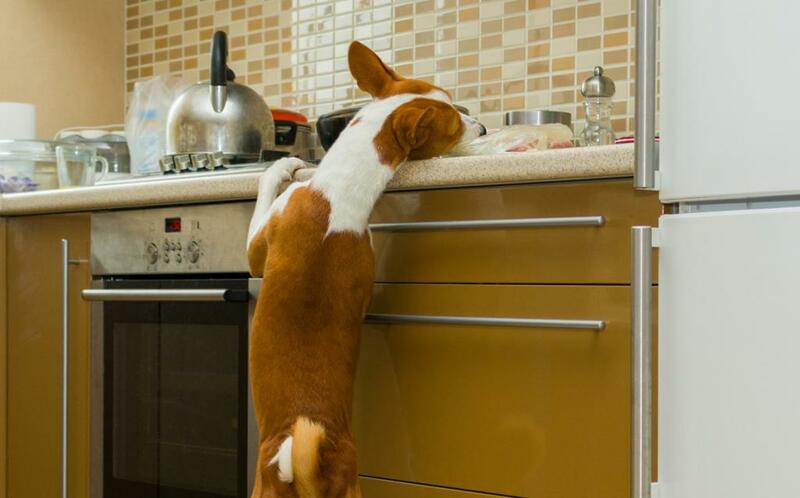 Kitchen counters may seem safely high enough to protect your dessert or roast dinner, but dogs can stretch like a giraffe when well motivated. The holidays can be busy, exciting and at times stressful for humans and it’s important to slow down, snuggle with your cat, take yourself and your dog for a walk and be on the alert for the risks of the season.